Who doesn’t like and look forward to a holiday? A few perhaps, but Christian and non-Christians the world over spend extraordinary sums of money in preparation for Christmas and Easter; although these time-tested traditions have different meanings for those who celebrate them. For two thousand years Christians have rejoiced in the birth of our Savior at Christmas time and the resurrection of that same Savior and Lord from the grave on Resurrection Sunday. However, for the die-hard secular among us, it’s no longer Merry Christmas … instead they wish you Happy Holidays. And Easter … well it’s just Easter: watching children hunt for hidden eggs and feast on chocolate Easter bunnies. For many, the most appealing attraction of Christmas or Thanksgiving or Labor Day or the 4th of July is a day or two off from work. We need all those days we can get! Right? For the observant Jew, there are seven Holy Days throughout the year, with some of these more hallowed than others … High Holy Days. Jews call these special times Festivals or Feast Days, which is the same description given by the Scriptures from long ago. For the more secular Jews who pick and choose which holidays to observe, they tend to concentrate on the first festival of the year, Passover, held in the Jewish month of Nisan (March-April); then the three back to back to back memorials in the month of Tishrei (September-October) of Rosh Hashana (Feast of Trumpets), Yom Kippur (Day of Atonement), and Sukkot (Feast of Tabernacles or Booths or Shelters). So what’s this Feast of Tabernacles or Shelters all about? And, what makes it totally unique in comparison to the other six Jewish Holidays? The annual festivals are first presented in the Torah book of Leviticus, Chapter 23; then in meticulous detail in Numbers, Chapter 29; and once again in summary fashion from the book of Deuteronomy. “You must observe the Festival of Shelters for seven days at the end of the harvest season, after the grain has been threshed and the grapes have been pressed … For seven days you must celebrate this festival to honor the Lord your God at the place he chooses, for it is he who blesses you with bountiful harvests and gives you success in all your work. This festival will be a time of great joy for all” (Deuteronomy 16: 13-15). In Leviticus and Numbers, more instructions are given such as cessation of all ordinary work on the first and last day of this seven-day celebration. Actually the last day is an eighth day … which is a literal translation (8th day) from the Hebrew, Shemini Atzeret. That 8th day is given the name Simchat Torah, which means rejoice in the Torah (Word of God). Other requirements plus the major reason for the Feast of Tabernacles can be found in Leviticus: “On the first day gather branches from magnificent trees—palm fronds, boughs from leafy trees, and willows that grow by the streams. Then celebrate with joy before the Lord your God for seven days … This is a permanent law for you, and it must be observed in the appointed month from generation to generation. For seven days you must live outside in little shelters. All native-born Israelites must live in shelters. This will remind each new generation of Israelites that I made their ancestors live in shelters when I rescued them from the land of Egypt. I am the Lord your God” (Leviticus 23: 40-43). The little shelter(s) are called a sukkah in Hebrew, which means a makeshift hut. In English, we might even use the word shack. 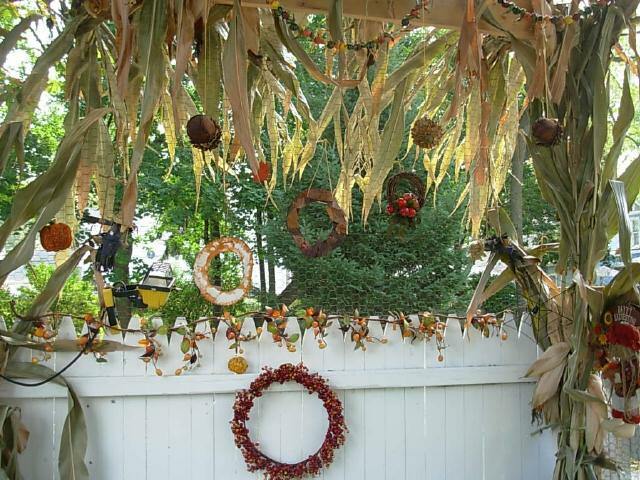 Many reading this article might ask, “What possible relevance does the Jewish Festival of Sukkot have in today’s world?” And, “do you mean to tell me that Jews still keep this tradition.” Answers: All the relevance in the world, as I believe you will see in this week’s and next week’s Part II article. Yes, millions of Jews and even tens of thousands of Christians celebrate this remarkable holiday, which began at sunset this past October 8th and ended on the 15th, a day of complete rest. Then the extra 8th day of Simchat Torah took place on the 16th of October. 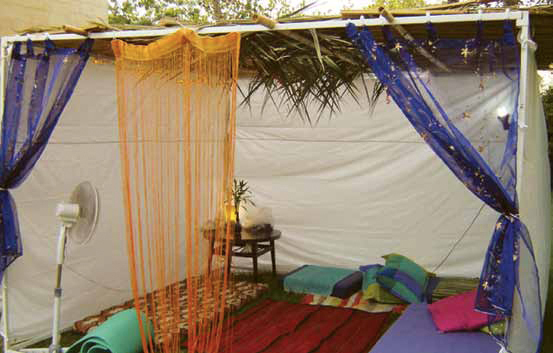 Jews all over Israel and in many countries of the world construct their own version of a temporary sukkot booth or hut in their backyard or on balconies or in open fields. There, for a week, they eat (mostly evening) meals, relax, sing songs, and entertain family and friends; some go so far as to actually sleep in the makeshift shelter at night. Included in their ceremonies are times of prayers and waving a bouquet—a collection of mostly leafy branches from the etrog (citrus type tree), palm and willow branches, and myrtle (boughs of thicker branched trees). Through a warm-hearted invitation from Israel’s President Reuven Rivlin, children throughout Israel helped him furnish his own sukkah. The youngsters hung decorations, all the while singing holiday songs. Although the Israeli office of President is mostly ceremonial (the Prime Minister is the actual head of government), this presidential interaction with Israeli children and citizens was truly remarkable. I suppose it would be equivalent to the US President inviting a sampling of children in America to decorate his Christmas tree; to truly remember that Christmas is all about the birth of Jesus Christ, the divine light that shines brilliantly in a dark world. Do you suppose our President would ever do such a thing!? Or for the President to summon a cross-section of America to wave sparklers and flags at an Independence Day festival in front of the White House, in remembrance of our deliverance from a tyrannical English king? Personally, I think it would be a great tradition for the next President to institute. It comes as no surprise that there are seven Jewish feasts ordained by God; this in keeping with the divine number seven replete throughout Scripture. They are: Passover, Unleavened Bread, First Harvest, Harvest or Pentecost, Trumpets or Rosh Hashana, Atonement or Yom Kippur, and Festival of Shelters or Sukkot. Let’s first look at some of the aspects of the Festival of Booths that are distinct, but not necessarily exclusive. In next week’s article we’ll examine the incredible feature of this Holy Day that is entirely unique in comparison to all of the other sacred holidays, both Jewish and Christian. It is one of two festivals that specifically emphasizes celebration for the entire family. The other feast is the Festival of Harvest. “You must observe the Festival of Shelters for seven days at the end of the harvest season … This festival will be a happy time of celebrating with your sons and daughters….” (Deuteronomy 16: 13-14a). But there’s more: “…happy time of celebrating with your sons and daughters, your male and female servants, and the Levites, foreigners, orphans, and widows from your towns” (Deuteronomy 16:14b, italics for emphasis). Along with the Festival of Harvest, the Feast of Tabernacles explicitly addresses the inclusion of foreigners or Gentiles. Plus it stresses attendance of non-family orphans and widows, i.e. the poor among them. Even servants are included. It is one of two festivals that lasts for seven days … the other being that of Unleavened Bread. The remaining five festivals are a one-day event. I believe there is a reason for this. The one-day festivals represent astounding events in which God decisively and conclusively intervened on behalf of his people, such as overnight Passover deliverance from Egypt, abrupt and authoritative forgiveness of sin on Yom Kippur, or resounding announcement of the New Year at the Feast of Trumpets. Whereas, the Unleavened Bread and Tabernacle festivals are meant to remember the ongoing provisions and protection of God throughout the long (eventually) 40-year journey to the Promised Land. It is one of the three festivals in which the Lord requires the men of Israel to physically attend and participate as a group in the place designated by the Lord, which in due course became Jerusalem. The pilgrimage of women and children were optional. “Each year every man in Israel must celebrate these three festivals: the Festival of Unleavened Bread, the Festival of Harvest, and the Festival of Shelters. On each of these occasions, all men must appear before the Lord your God at the place he chooses…” (Deuteronomy 16:16). Two of these conditions—travel to Jerusalem and participation of the Gentiles—will be highlighted through a fascinating prophecy found in Zechariah, which we will cover next week. But already God, through Moses, is preparing his special possession Israel to grasp the significance of the Festival of Tabernacles’ application to all peoples and the very purpose for annual observance of this vitally important event. If the Jews were going to be a light to the Gentiles, then select Holy Days should be shared with foreigners. Thus, the Feast of Shelters looks both to the past and the future. *Note: A handful of times since Israel’s rebirth as a nation in 1948, Jews have made pilgrimages to Jerusalem to keep the Festival of Shelters. The most recent was just this past week. Thus, this tradition has made a come-back for both religious and secular Jews. The physical means and spiritual purpose for Israel’s celebration of Shelters is summarized as follows: “For seven days you must live outside in little shelters. All native-born Israelites must live in shelters. This will remind each new generation of Israelites that I made their ancestors live in shelters when I rescued them from the land of Egypt. I am the Lord your God” (Leviticus 23: 42-43). Extraordinarily remarkable is the fact that the Hebrews were still living in these makeshift temporary shelters when God through Moses gave them the Law, the Sacrificial System of Atonement, and the Festivals. Thus, God is assuring them that they would one day dwell in permanent houses, and otherwise fulfill their destiny in the Land promised to them as an eternal inheritance. In God’s plan and sovereignty it was a done deal. The Lord is telling his people to keep this festival as though they had already reached their destination and were looking back in remembrance of the arduous and perilous journey. Had the newly delivered Hebrews fully trusted the Lord, they would have entered the Promised Land a year from the Exodus. Instead, it took an agonizing forty years of wandering in circles through the Judean wilderness. They made it far too difficult on themselves. It’s quite evident: When they finally reached the Promised Land (again), they had learned resolute reliance and deferred dependence on the Lord God the hard way. For those who still had some doubts, God convinced them during their first major battle that victory over their enemies and inheritance of the land was possible only when they trusted and obeyed the Lord. The Battle of Jericho clearly taught them this principle. It was a simple but awesome victory. By the time the walls came tumbling down, the battle had been won. And what did the Hebrews do? Exactly what they were told to do: March around the walls seven times, blow the trumpets, and shout. That’s all? Yes, that’s all they needed to do, i.e. trust and obey the Lord their God. When they finally took possession of the Promised Land, they ate food that they neither planted nor harvested, drank wine that they didn’t produce, wore clothing that they didn’t weave, and lived in houses they didn’t build. All because of God’s sovereignty, grace, and bounty. In addition to the books of Exodus, Leviticus, Numbers, and Deuteronomy—before and during the great trek through the wilderness—the Psalms and many other Old Testament books frequently refer to the miraculous delivery of the Hebrews from Egypt after the fact. And there are several review type references in the New Testament. Through all of these passages we can vividly see two distinct reasons why God wanted his people to keep this Festival for all time: To remember God’s faithful Protection of and Provisions for his people. From the plagues in Egypt, including the most deadly of all—the Angel of Death’s killing of all Egyptian firstborn males. All ten judgments were miraculous displays of God’s power and providence, while protecting his people. With their backs to the Sea and facing certain destruction at the hands of Pharaoh’s chariots, God majestically split the sea into dry land, allowing all of the Israelites to cross over; then drowning all the Egyptians who had the audacity and arrogance to pursue them. This is the most talked about miracle in Scripture, and the most recognized supernatural deliverance of all time. All of God’s miracles are blockbusters, but the parting of the Red Sea, along with the Virgin Birth of Jesus and his Resurrection, are off the charts. Divine deliverance from marauding hordes of bandits and murderers, and from attacks by and against mighty armies before, during, and after entrance into the Promised Land. Though the Jews were required to fight, all of their victories were directly attributed to the Lord’s protection and enablement. For example: The astounding victory over a much better armed and trained Amalekite army while Moses held his staff over his head for an entire day. Moses became so weary that Aaron and Hur helped Moses hold his arms up. As a symbol of Israel’s dependence on the Lord, as long as the staff remained elevated the Israelites prevailed, until the victory was finally won (Exodus 17). Through prayerful pleading by Moses, the Israelites were protected from annihilation by God, himself. This after showing their “gratitude” for their liberation from Egypt by building a despicable and detestable golden calf idol. From even more (massive number of) deaths by ultra-poisonous snakes, because of their constant complaints, continuous ingratitude, and ceaseless distrust of God. “…But the people grew impatient with the long journey, and they began to speak against God and Moses. ‘Why have your brought us out of Egypt to die here in the wilderness?’ they complained. ‘There is nothing to eat here and nothing to drink. And we hate this horrible manna!’” (Numbers 21: 4-5). Those familiar with this part of the wilderness saga will recall the bronze serpent lifted up on a pole and miraculous recovery of those bitten by snakes; if they would simply look at the bronze replica and believe that God would heal them by such a simple childlike act of contrition and obedience. Manna from heaven… the food of angels! Gathered every morning, enough for each day. If they gathered too much, it spoiled. “So the people of Israel did as they were told. Some gathered a lot, some only a little. But when they measured it out, everyone had just enough. Those who gathered a lot had nothing left over, and those who gathered only a little had enough. Each family had just what it needed. Then Moses told them, ‘Do not keep any of it until morning.’ But some of them didn’t listen and kept some of it until morning. But by then it was full of maggots and had a terrible smell. Moses was very angry with them” (Exodus 16: 17-20). Before the manna appeared the next morning, “That evening vast numbers of quail flew in and covered the camp…” (Verse 13). For anyone who has ever hunted quail, it’s not all that easy, at least not without a bird dog. Here, the birds flew directly into the Israelites’ cooking pots! (Paraphrasing). Yum … all the meat they could eat! The same staff that Moses used to strike the Nile with blood and held aloft to part the Red Sea, he also used to smite solid rock. When he did, streams of water gushed out to quench the thirst of hundreds of thousands of Israelites in the wilderness (Exodus 17). This happened again as recorded in Numbers Chapter 20, and water poured from the rock. The very finger of God that blazed the Ten Commandments onto stone tablets on Mt. Sinai, providing the very essence of the Law to God’s people and ultimately standards of morality and right and wrong for all humanity. For forty long years wandering through the wilderness the Israelites’ “…clothes didn’t wear out, and your feet didn’t blister or swell” (Deuteronomy 7:4). Amazing! The ever-present cloud by day and the majestic pillar of fire by night continuously pointed the direction to go. That was the best GPS ever known to man! Right there in front of them. When the cloud moved, they broke camp. When it stopped, they stopped and set up their shelters (sukkah). The next morning they gathered more manna! Hey, for you wilderness junkies, it doesn’t get any better than that! Time and time again God was faithful when his people were not; when they doubted him, complained against him and Moses about what they didn’t have, and even grumbled over what they did have. But not without consequences, the most obvious of which was forty years of God’s discipline that confined them to the Judean desert. During which time they had no permanent dwelling places, no real home and hearth to retreat after a long day of work or wandering. Some had tents that they carried in carts or on the backs of their animals or on their own backs. However, most of the people undoubtedly erected a lean-to type shelter made from whatever branches or material they could find or carry. But through it all, God supplied their physical needs … whether through a miracle or through natural provisions along the way of their seemingly never-ending expedition to the Promised Land. Because the adults who were delivered from Egypt disobeyed God and refused out of doubt, fear, and lack of trust to enter Canaan, only those less than twenty years began the 40-year passage. When they finally arrived at the threshold of Canaan, here is what Moses reminded them, “And now, Israel, what does the Lord your God require of you? He requires only that you fear the Lord your God, and live in a way that pleases him, and love him and serve him with all your heart and soul. And you must always obey the Lord’s commands and decrees that I am giving you today for your own good” (Deuteronomy 10: 12-13). The Bible’s inherent definition and meaning of fear of the Lord is not running scared or being frightened. Rather it means reverent respect and deep awe that leads to worship. It also implies complete trust in the Lord … that he is who he says he is and does what he says he will do. Included in the Lord’s commands would be, of course, to celebrate the Festival of Shelters—which above all the other festivals depicted the awesome protection and provision God lavished on his people, even though they didn’t deserve it and certainly didn’t earn it. The Feast of Tabernacles would remind them of God’s faithfulness to protect and provide; that he could and should be trusted at all times, for all things, no matter what. “And it is impossible to please God without faith. Anyone who wants to come to him must believe that God exists and that he rewards those who sincerely seek him” (Hebrews 11:6). The all-inclusive lesson(s) to be learned by the ancient Israelites regarding the unnecessary generation they spent in the wilderness and how this is part and parcel of the need to always remember what happened, and this remembrance should be summoned at least once a year by observing the Feast of Tabernacles, is powerfully expressed in Psalms Chapter 78. “Yet they kept on sinning against him, rebelling against the Most High in the desert. They stubbornly tested God in their hearts, demanding the foods they craved. They even spoke against God himself, saying, ‘God can’t give us food in the wilderness. Yes, he can strike a rock so water gushes out, but he can’t give his people bread and meat.’ When the Lord heard them, he was furious. The fire of his wrath burned against Jacob. Yes, his anger rose against Israel” (Psalms 78: 17-21). And what exactly was it that made God angry, the opposite of which is the very thing that pleases God? The very next verse in this chapter answers that question and provides a succinct summary of just how the Lord places all of the things we do or don’t do in a box (so to speak). And this box has a label with but two words: Trust Me. The Lord’s anger rose against Israel because, “…they did not believe God or trust him to care for them” (Psalms 78:22). In verses 23 through 31 we read a summary of the Exodus account of the miraculous provision of quail and manna. Followed by: “But in spite of this, the people kept sinning. Despite his wonders, they refused to trust him” (Psalms 78:32). Despite miracles he performed equal to those in Egypt, the greatest of which was Resurrection from the dead, Messiah Jesus was still rejected by his own people. For this reason, The Lord withdrew his protection of and provisions for Israel. In less than a generation after Christ arose from the dead, they were crushed by the Romans and exiled to nations all over the world, just as Moses said would happen (Leviticus 26). Not until the rebirth of Israel in 1948 and especially the recapture of the Holy City of Jerusalem in 1967, did God restore his prophetically promised protection of the Jews. Many Israelis are beginning to see and understand that God once again is demonstrating his love and mercy for the Jews and for Israel. Defeat of their enemies against all odds in four major wars and several other clashes with terrorist groups have proven that. The next step is for all Israel to embrace their Messiah! Stay tuned for next week’s article. “The Lord is a shelter for the oppressed, a refuge in times of trouble” (Psalms 9:9, italics for emphasis). “Those who live in the shelter of the Most High will find rest in the shadow of the Almighty. This I declare about the Lord: He alone is my refuge, my place of safety; he is my God, and I trust him” (Psalms 91: 1-2, italics for emphasis). “Trust in the Lord with all thine heart; and lean not unto thine own understanding. In all thy ways acknowledge him, and he shall direct thy paths” (Proverbs 3: 5-6, KJV). Webster’s Definition of Trust: “assured reliance on the character, ability, strength, or truth of someone or something” (italics for emphasis). Jesus said, “I am the Way, the Truth, and the Life.” (John 14:6).